Well I’ve been doing a “Missions Tour” this year as a vacation. Not quite a “Stay-cation” as it does run 2/3 the length of California. But still mostly based out of “home”. It has been very enjoyable. I’ll be putting up some pictures as I get the good ones sorted out. But one thing struck me more than most while looking at these facilities. They were raised up from mud. Here were a few individuals with nearly nothing, and they made grand buildings. Workshops. Tanneries. Kitchens and housing. Altars and rectories. All raised up from mud. So look at those buildings, then wonder: “When do we run out of mud? Is there a shortage of mud? What will we do when all the mud is gone?” and realize just how silly it is to think we ever run out of resources. All it takes is a little imagination and anything becomes a resource. There is no shortage of resources. There never has been, and there never will be. 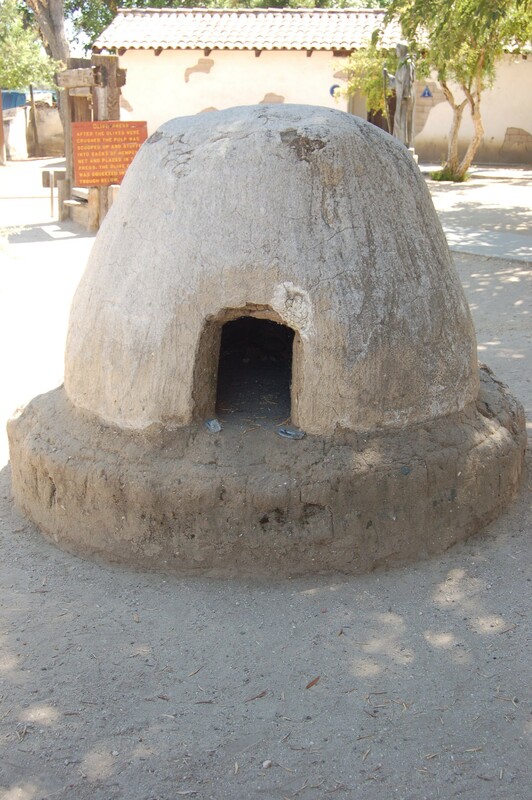 There were also similar indoor ovens at some missions, with poles overhead for smoking and drying meat and fish. Embrace the abundance we have been given and all things are possible. It’s amazing what can be made from a bit of mud. Even us. This entry was posted in Earth Sciences, Human Interest and tagged Missions, preparedness, resources. Bookmark the permalink. Oh quite being so optimistic, lol. No one is going to believe you, they much prefer the view that humanity is the virus that is destroying the natural world. We must be punished for the crime of existing. Goes right over my head, I just can’t grasp that concept of the world. If you have not read it yet, Matt Ridley’s “The Rational Optimist” is a good read. I did a quick Google on “the world is running out of” and it was illuminating. Oil was the #1 hit, by far. Water was #2. Silver and Helium, apparently. I imagine Helium supplies are quite limited, to be fair. Yet when you dig down the links, you find most are discrediting the apparent shortage. The water ones point out that the issue is almost always governance, not a shortage of actual water. Many explain that the problem at the moment is shortage of demand for farmers, not supply of food itself. All in all, I reckon the Malthusian tendency is running out of steam, except among the eco-nuts. Too many doom laden projections have failed for most people to worry overly. It’s better now than when the Club of Rome was at its worry-wort peak, back in the 70’s. Moving mud is mega hard labor. 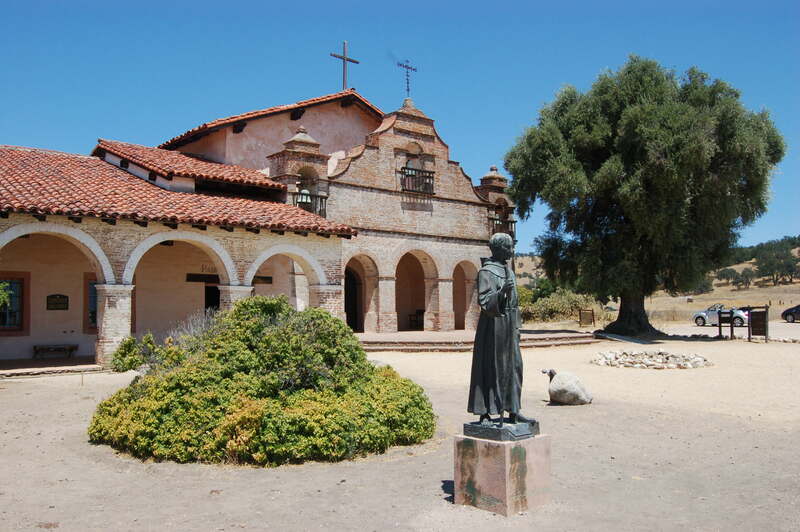 The missions were built by many hands over an extended period. But they were built to last, except for earth quakes and floods. It may be a long way off but eventually one resource is guaranteed to run out: the Sun. We need to realize that Earth is only a stepping stone and start focusing more on space exploration. Unfortunately, as NASA’s climate change budget increases their space exploration budget is being cut. From The Coal Question: An Enquiry Concerning the Progress of the Nation, and the Probable Exhaustion of Our Coal-mines By William Stanley Jevons, 1865 . @J Ferguson: I see we have a shortage of self restraint too 8-) but so far not a shortage of humor on our side at least.. Helium is an interesting one. We largely get it from a few helium rich natural gas wells that are depleting. As prices rise it will be ‘worth it’ to take the smaller amounts out of the natural gas from wells that are less rich. It’s a fairly classic ‘resource increases with price’ problem. Though with a twist. The percentage ratio is quite high between the rich wells and the others. Also, the helium vented to the air DOES have some leave the earth. It floats to the top and can leave. Then again, we have a bunch of helium ions arriving each day on the solar wind along with another bunch made each day from nuclear decay. (The origin of what we do have is most likely the same reactions that drive the volcanism of the planet, uranium and thorium decay). So while we may ‘run out’ due to the major wells running out, we have plenty more available “at a price” and especially if we start to use more nuclear reactors. Oil: We will hit a peak production point at some point, and will then substitute some other energy source at the margin. We can also make oil from any carbon source, so in the end it will just be a carrier for nuclear power (that we have in functionally infinite supply.) So folks are in a panic over the eventual transition of energy supply that they are at the same time promoting…. very strange. In California we constantly have “drought crisis” events foisted on us. One Small Problem: People only consume a small percentage of the water. Something like 5% or so goes to cities. The rest is used for agriculture… We grow water intensive crops like cotton and rice. The simple fact is that we can simply switch to crops that don’t need as much water and make available enough water for double the population. If we wished. There are also crops being developed that grow in salt water. Tomatoes is one (and we grow a lot of tomatoes in California). So in a hundred years we will be able to irrigate large chunks of land with saline or brackish water. But thw water stays here, it doesn’t go away. Silver is a surprising one. It’s a ‘waste product’ of the production of copper. We have a ‘shortage’ during economic downturns when copper production for industrial use is cut back. Then we have a surplus during times of rapid economic growth (building homes, cars, electric systems). An interesting example is “Pearl Rice”. Makes more per acre than long grain. That’s why “CalRose” rice is often cheaper than long grain. Yet in the “shortage” years back in the ’70s or so, many folks in ‘poor’ countries didn’t want it as it didn’t cook the same. (Not as fluffy, a bit stickier). So even here, we could have more food if folks changed the menu slightly. This simple fact is we can do what we want, and we want things other than quantity. At this price. You always score in the top when content is subjected to semantic analysis. I like your choice of topics, chosen perspective, objectivity, rationality and manners. Most often there’s no other comment I’d care to make, but I don’t want to be repetitious.. These are the same people who fail to understand why accidents might increase when cars come with more features increasing the probability of survival in case of an accident. E.M. – Great photos (I take it since you are normally so careful about attribution that these are your own). I’ve been in a few straw bale / lime plaster houses – amazing. At the moment I am entranced with sod roofs. especially the Nordic ones. I have a ‘mini-tripod’ about 10 cm long that I brace against my chest, take a breath, then hold and tighten until… shlonk! and it’s a hand held no-flash inside a dark ambient light picture. Maybe a tiny bit of motion blur, but not very much! I can hand hold down to about 1/4 to 1/8th the normal speed with that trick. I’ve done 1/8 second exposures some times… The only motion is the rocking of the body and the lever arm from the feet is very long. If you ‘relax right’ and time it well, even that is minimized. This was done with a modest speed zoom lens, not a high speed lens, as I needed that perspective. Behind the oven is an olive press (near the sign). This is more a ‘documentary’ shot. I thought of cropping the foreground sand, but like the ‘invitation to approach’ feel that it gives. (I could do without the ‘bathroom’ blue triangle on the outhouse behind it, though ;-) but then I’d lose the tree. Used ‘bit of tree’ to cover one. Someday I may photoshop them out, but I like my pictures ‘honest and unadorned’ so I’ve not done that to any, ever, yet. I waited a fair amount of time for the silver VW to leave in the exterior shot, but they didn’t. So it intrudes just a bit into the shot. I’ll probably go back some day and reprise it sans cars. The tree is a very very old Mission Olive. Genetic tests have shown Mission Olives don’t match genetics of any particular strains in Europe, so they think seeds were used (normally cuttings are used to assure a good type) and they just took a few years to re-develop an olive that works well here. Seeds also made the voyage here more easily. The statue is of Fray Junipero Serra ( November 24, 1713 – August 28, 1784) the Catalan Franciscan friar who made the whole thing happen. I’ll post more as it fits well with the general news flow and other events, and as I get “edit time” and topics they fit. @Chuckles: That is GREAT! Never heard it before and now I’m hooked! We must immediately institute “Mud Cap and Trade” to conserve the worlds mud. Do it “For the Hippos!” ;-) We must protect them from the looming Mud Shortage!!! Global warming is going to reduce rainfall and the mud will all dry up to dirt. It’s a catastrophe in the making!!! Thanks for keeping this issue at the forefront and thanks to Sinan Unur for refering us back to your post on the Jevin Paradox. New efficiencies give us new, exciting possibilities, not fewer. I hope your blog is attracting an increasing readership. We need leaders who understand that hard work in the pursuit of affluence/prosperity is a life well lived and that technological innovations with Earth’s current abundance offer immense possibilities. I keep erasing lots of comments about politics and beliefs and the necessity of capitalism, but I can start my own blog for those. Suffice it to say that I believe American capitalism has been the grandest experiment thus far. I think “it” has made serious mistakes along the way, primarily by not making allies of the entrepreneur/capitalist and the worker (yes, I am a liberal) in the great ventures (yes, cheap immigrant labor….). If both “sides” could get together, then your knowledge about resources, affluence, possibilities could have a vibrant home. They did not. They have not. “Conservatives” continue not to include “me”. Now I wonder what is possible when marxists (“progressive” is a misnomer) are swarming all over our government. I guess if I wanted to be infected with your optimism, I might say: “everything from mud”! Keep up the good work, and please fix your tip page. You deserve a better one. Is the wonderful interior shot the space under the taller roof topped with a cross in your exterior photo? 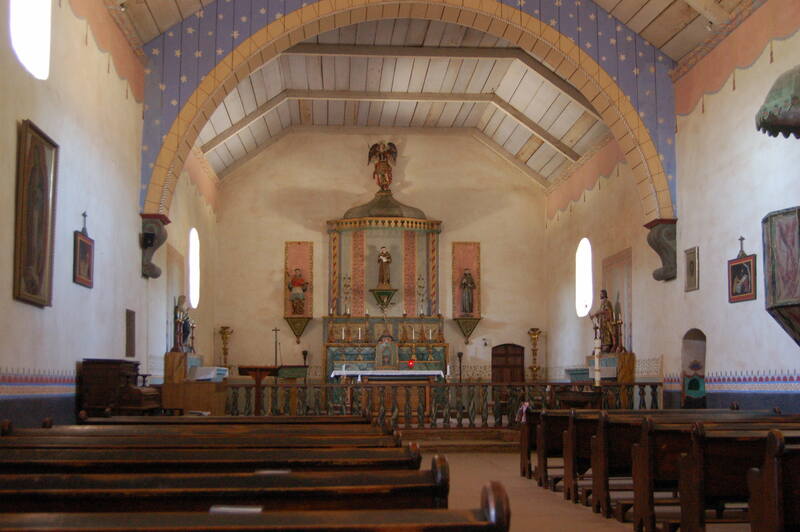 I ask because I’m trying to figure out how the roof above the chapel is supported, maybe by really big wood beams running parallel to the aisle and above the very nice paneling shown in your picture. In 1959 I saw a simple stone church from early 17th century a bit north of Mexico City. The roof was a stone barrel vault. The axis of the vault ran parallel to the nave. We were told that they either couldn’t find or couldn’t afford suitable timber for false-work so they filled the nave with dirt compacting it as they went, then formed the top to support the laying down of the stones in the form of a vault. On completing the vault, they dug out the dirt. The cleric who was our guide said that they often thought about the meaning of getting the dirt out of the church, but decided whatever it meant should remain unsaid. As is frequently repeated on some of my favorite blogs, engineering is making what you need out of what you have. People need more confidence that this skill is still prevalent. Yes, the exterior shot is of the main entrance to the church. the interior is from about 1/2 way from the back toward the Altar. The roof and ceiling support structure is all wooden, though with fired clay tiles on top as roofing material. Ah well. I’m in a muddy middle ground too. I’m from California, so don’t see where the Federal Government has any business in the bedrooms of anyone any time. Nor, for that matter, in what they ingest, inhale, or otherwise do for fun. Then again, I don’t see where anyone in DC ought to be taking my money, either, and think they ought to let businesses get about the business of improving products, making money, providing jobs, and basically doing all those things government fails at so often. Better to spend all our treasure to solve potential far-in-the-future problems right now. No need to expect that technology will improve any more in the next 4 centuries than it has in the past 4 centuries, right? I see it a bit differently. It’s not about anything rational like “Now” vs “future” technology. It’s all about the front of my pants. Wait, what are you thinking!!! The Republicans are terribly concerned about what I might do with what is in the front of my pants, and they wish to control it, for my own good, of course, to assure that No Sin Is Done!!! While I just want them to leave everything below my waist alone! Please. Everything “down there” is mine, and get your hands off! NOW!!! But that seems to be too much to ask of either side. “Out Of My Pants, Please” is a request too far. I think you’re onto something with the mud, definitely needs to be conserved. I mean, every time there’s a drought, the supply dries up (as it were), resources disappear, potentially leading to such things as deprivation and housing shortages in Africa and other parts ofthe third world. Oh wait, that’s the normal situation, isn’t it? Flanders and Swann were very much what we callow youth were subjected to in the fifties in England and the far flung colonies. Probably considered VERY politically incorrect these days, their national song for the English ‘A Song of Patriotic Prejudice’ is a masterpiece of such. I take great delight in reading your blog, your comprehensive understanding of reality shows me that some intelligent life still inhabits our little blue world. Resources and their use are our only future, once upon a time we were instructed to go forth and subdue the world. Some I fear have forgotten the instruction manual. Nothing in this world for us is finite, for we have the capability to think and invent. Currently the world seems to be devoid of visionaries in high places. Cycles come and go, including those that try to impose a vision of stupidity. Invention can create alternatives that make the rare substance an obsolete commodity. Mud, especially builders mud is an infinite resource. Modern builders mud i.e. concrete can be made from many things. The waste from coal fired power plants is the best material for the manufacture of builders mud, bar none. This is usually put in big piles and wasted.? ?